The 9th – 14th October 2017 is Libraries Week. I’m very proud to work in a library and even more so to focus my work in a children’s library. Every day I see the impact of the library on children, parents, trainee teachers and lots of others besides. Libraries offer something which so few places do now, a safe, non-judgmental sanctuary for anyone and everyone to visit. Libraries offer knowledge, interest, fun. They provide educational support, craft sessions and events, warmth, comfort and most importantly books!! All completely free. It’s quite amazing when you think about it! 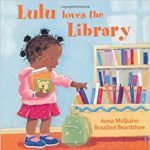 There are some wonderful books out there celebrating the joys of libraries! And I want to share one recent addition to my blogging pile along with some other favourites of mine. 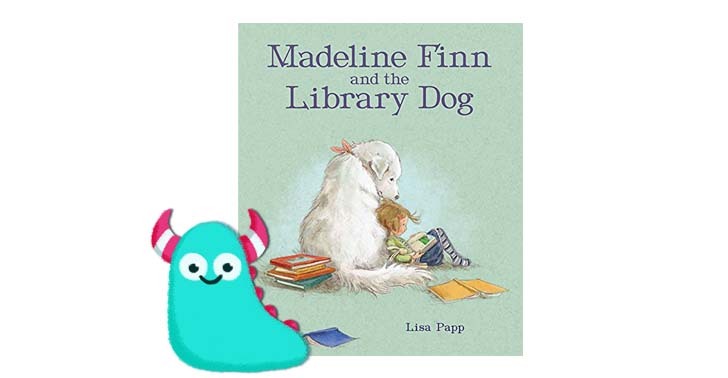 This is Madeline Finn and the Library Dog by written and illustrated by Lisa Papp and published by the wonderful Old Barn Books. This gorgeous picture book tells the story of Madeline Finn, who isn’t keen on reading, of any kind, books, a magazines or even ice cream menus. But one day, Madeline meets Bonnie a library dog, and she discovers that reading is not actually that bad. When she reads out loud to Bonnie, she loses her fears and inhibitions of saying words wrongly, and just enjoys Bonnie’s relaxed and non-judgemental presence. Soon Madeline’s confidence in reading improves, and she braves reading in front of her teacher. What is most special about this book, is that this story is actually based on a real life campaign called Read2Dogs run by www.petsastherapy.org. And for every copy sold in the UK, Old Barn Books will give the UK campaign 50p. The US edition supports the American version of the campaign. How fabtastic is that? What a lovely idea to encourage relaxed reading in libraries! 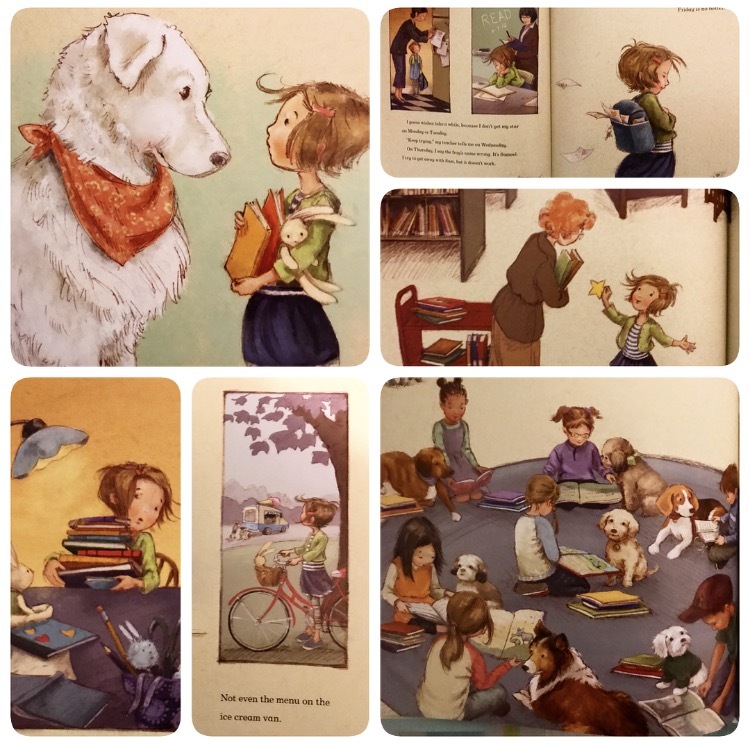 Madeline Finn and the Library Dog is beautifully written, it’s a nice length story, gentle and calming to read and the fact that it’s based on true events is wonderful! The illustrations reminded me slightly of Shirley Hughes as they are sketchy in style, colourful and bursting with character, yet Lisa Papp has very much her own style here too, particularly with her incredibly endearing faces which make you instantly warm to the characters! It’s a truly gorgeous book to look at, I fell in love I have to say. And being about a library, there are book illustrations everywhere, alongside beautiful dogs!! What more could you ask for really? It’s a lovely sweet tale showing how any child can and will read given the right environment and support! Old Barn Books have created a beauty here in their publication quality also. The illustrations are displayed on thick off white paper, giving them a quality feel and depth. 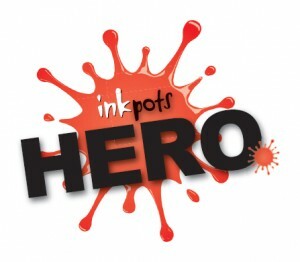 It’s a brilliant collaboration between author/illustrator and publisher. 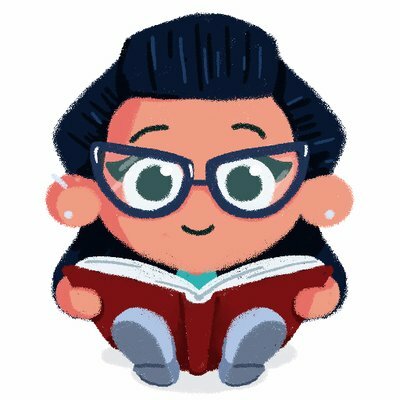 Highly recommended by this enthusiastic story and library lover! 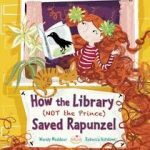 Although this story does present a slightly outdated view of what libraries are like now, it’s just SO stunningly illustrated and beautifully told that it’s really impossible not to love it. 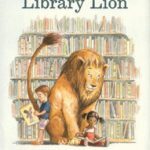 It is actually one of my favourite books, mainly for the lion illustrations inside which make it so worth picking up! 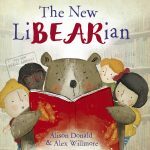 A gloriously entertaining picture book in which a bear takes over the role of the Librarian. It’s funny, it has twists and turns, and is ridiculously silly. The illustrations are detailed, bright and colourful and every page offers a new piece of excitement! Another favourite of mine! Rosalind Beardshaw’s illustrations decorate our Sheffield Library little library van and the entrance to the library where I work and they are fabulous! This is one reason why I love Lulu Loves the Library. But I also love its simple guidance on what libraries are all about, perfectly pitched for little ones. This is just a brilliant story showing how females are quite capable of rescuing themselves. Nothing can tempt Rapunzel from her tower other than a job at her local library. It’s brilliant, read it please! So there you are. Al the above books and MANY more are available from your nearest library now. Thank you for reading these Book Monster reviews. If you don’t already, please do make time to visit your local library. They are truly treasure troves of escapism, learning and expertise. Support these rare and gentle buildings in order to nurture their future existence. Thank you.